With sales booming, Skoda has high hopes for its new Citigo – even saying it’s the most important new model in the history of the firm. The all-new Citigo marks the start of a new era in the company’s 117-year history. As the sixth model in the multi award-winning line-up, and ŠKODA’s first ever city car, it expands the brand’s value-for-money appeal to a new type of customer. Prices start at £7,630 for a car which sets new standards in comfort, convenience, environmental considerations and technical sophistication. The brand’s debut in the fast-expanding city car segment, it’s also the first new model to wear Skoda’s revised ‘winged arrow’ corporate badge. Apparently, this fact “perfectly illustrates the Citigo’s huge significance for the company”. Aimed at younger drivers, families who need a second car and older motorists with an active lifestyle, Citigo has a spacious and bright cabin which can carry four adults. It also has the largest boot in its class and a five-star Euro NCAP safety rating. The 1.0-litre three-cylinder petrol engine comes with a power output of either 60 or 75PS, plus the option of GreenTech fuel-saving technologies including stop/start and brake energy recuperation. A newly developed five-speed manual transmission is standard, though an automatic gearbox is available on selected models. 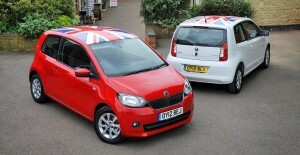 It means the Citigo has official combined fuel economy as high as 68.9mpg. It’s a pretty decent car and Skoda are putting a lot of effort into making it a success – even their bonkers advertising campaign saying the Citigo is ‘your new communications tool’ is eye-catching. This entry was posted in News and Views and tagged caption, car, Euro NCAP, fuel economy, GM, KODA, LS, MoT, motorists, price, skoda, skoda citigo, speed by Steve Lumley. Bookmark the permalink.